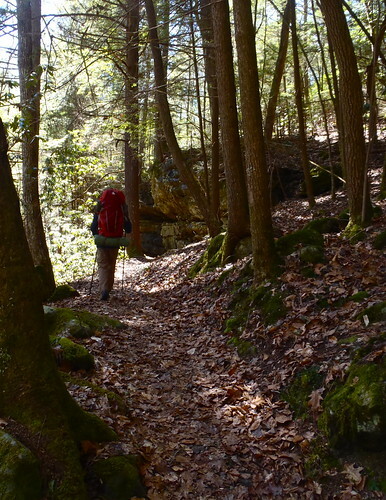 An overnight trip along the Sheltowee Trace earlier this month piqued my curiosity about the area of the Daniel Boone National Forest north of Cumberland Falls, and I returned to the area two weeks later for a two-night backpacking trip to spend more time and explore a bit. Unlike the previous trip, I had company -- my friend Justin who joins me on a few backpacking trips each year and who doesn’t mind getting off the beaten path (Daniel Boone National Forest: http://www.kywilderness.com/forum/index.php?topic=6478.0 ; Joyce Kilmer-Slickrock Wilderness: http://www.kywilderness.com/forum/index.php?topic=6530.0 ). Given the relatively unambitious mileage for this trip, we were able to focus on three components of backpacking that had been neglected on our most recent trips: photography, “gourmet” food and off-trail exploration. This proved to be an enjoyable adjustment to our backpacking style and was a great way to begin the spring season of backpacking. Like my past trip ( http://www.kywilderness.com/forum/index.php?topic=6906.0 ), the route was from the Bark Camp Creek trailhead to Cumberland Falls. Including the side-trip to Dog Slaughter Falls the total on-trail mileage was slightly more than 10 miles. We would hike in about 2.5 miles the first night, camp at Bark Camp Creek shelter, continue 2 miles the next day to Star Creek shelter, and then complete the rest of the hike to Cumberland Falls the next day. This easy mileage was perfect for both of us -- our packs were slightly heavier than usual because of the food, plus Justin hadn't hiked since October and I was recovering from a weekend spent bicycle riding and rock climbing. We carried lightweight tarps and ground cloths in case the shelters were occupied, or if we found a campsite that was just too good not to camp at, but ultimately we ended up camping at the shelters both nights. 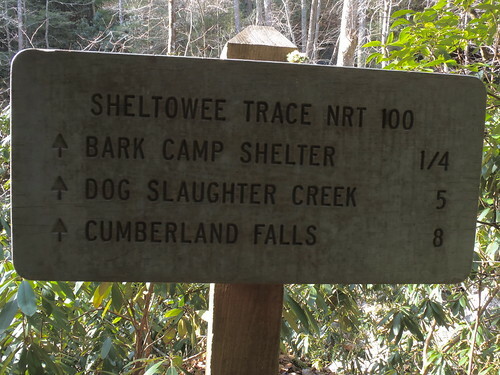 Also like my previous trip, we were dropped off at the trailhead by Sheltowee Trace Outfitters. The small trailhead is poorly marked (i.e. completely unsigned) and is the type of place you should only leave a vehicle overnight if you have comprehensive coverage car insurance, lack of attachment to material possessions and a good sense of humor. In addition, the trip seems to flow better hiking from Bark Camp Creek Trail to the Sheltowee and onward to the state park. Down a creek then up the river. Charming in its simplicity. During the ride to the trailhead I remarked that I thought it odd the two shelters were only separated by two miles of trail and the employee informed me that they were actually built as boat-in shelters, with proximity to the Sheltowee Trace apparently being little more than an afterthought. 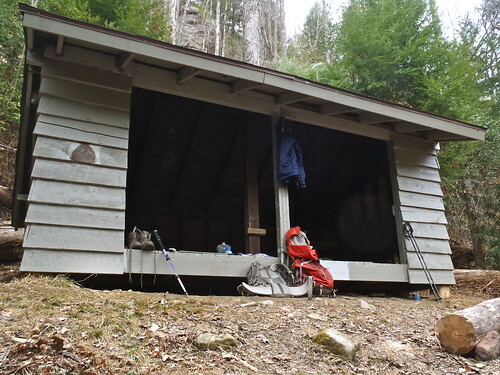 Regardless of the original intent, the shelters provide a rare treat to backpackers in Kentucky and I hope they continue to be maintained and enjoyed by persons who practice Leave No Trace. 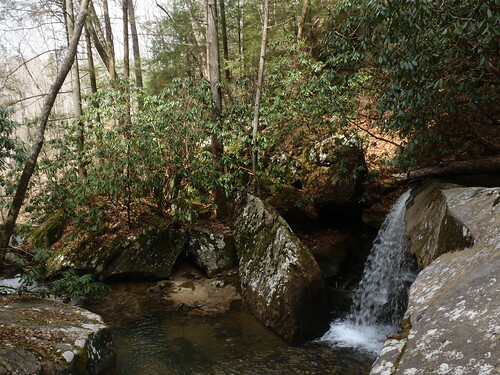 We started along the Bark Camp Creek Trail in the early afternoon and found ourselves hiking through the shaded forest under a blue, cloudless sky that provided a perfect ceiling to the walls of hemlock, rhododendron and cliff that the trail wound through. The day was crisp -- at no point could we exhale without seeing our breath and pellets of snow from the previous night persisted in shaded patches amongst ferns and mosses -- but comfortable for backpacking. It seemed like we had barely begun to hike before we set our packs down to begin a side trip up a tributary of Bark Camp Creek. 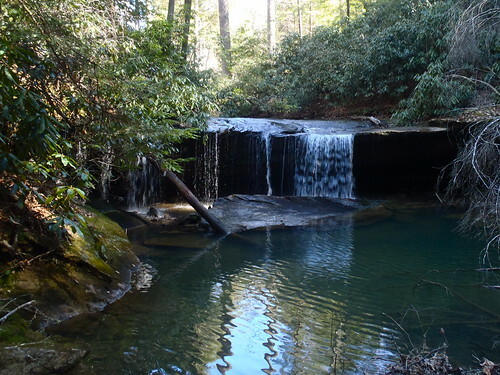 From looking at a map of the area, it appeared that the stream would likely have a modest but not insignificant waterfall a short distance from its mouth. Scrambling along creeks and clifflines in search of vague, unpromised rewards has become an almost standard part of my backpacking and hiking trips. Often whoever accompanies me gets swept along and ends up wading through rhododendron, stumbling up and down to clifflines and across creeks, and eventually vows to keep their feet firmly planted on the trail rather than accompany on my next foray into the dusty corners of the Cumberland Plateau. On this particular micro-adventure, we undershot the stream’s mouth (to our credit, our only navigational aids were a black-and-white photocopy of a topographical map and a compass) by a hundred yards, realized our mistake, and pushed on through the streamside rhododendron until we saw the mouth of the stream and begin to look for a way across. This would have been a “boots off, pants rolled up” ford through frigid water in chilly temperatures were it not for a tree that had fortuitously fell from bank to bank within 50 feet from the mouth of the stream; a natural bridge to the land beyond. We scrambled across the tree and to the mouth of the small stream, which had an encouraging flow and was large enough to provide a reasonable corridor for our upstream travel. 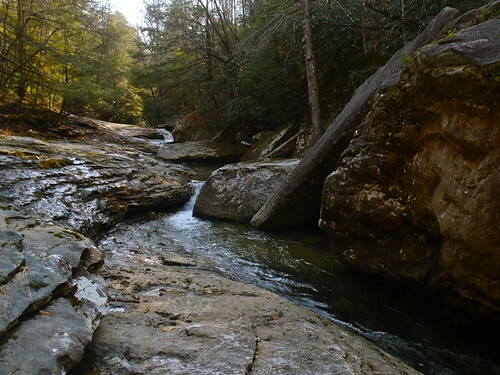 The stream was similar to most minor tributary streams in the Cumberland Plateau -- this stream wouldn’t have been a bit out of place in the Red River Gorge. As we progressed upstream, the cliffs began to close in on the stream in certain spots and the gradient increased slightly. 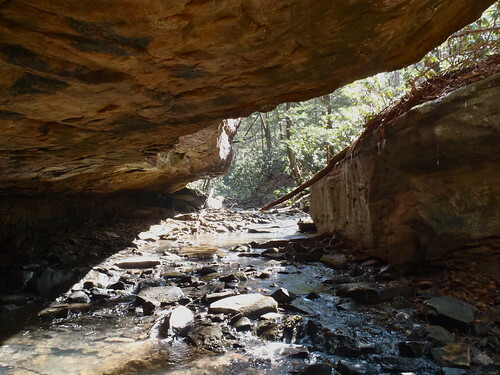 After scrambling through boulders in a rockshelter that partially covered the creek we were reassured by a faint rumble of water and soon found ourselves at a streamwide, ledge waterfall perhaps five feet tall with a pleasant pool beneath it. We enjoyed several minutes of photographs and peaceful contemplation at this waterfall -- seldom visited, with not a footprint or speck of trash in sight -- before following the cliffline back to the mouth of the stream and crossing back to our packs. We continued on Bark Camp Creek Trail toward the shelter with smiles on our faces and absolutely no sense of urgency. The off-trail micro-adventure had only consumed about an hour of time and we still had several hours of daylight left. So we walked the trail at an unhurried pace and reached the cascades and nearby shelter around 5 p.m. Both of us held the opinion that the trail was a great hike intrinsically; the cascades are merely a bonus instead of a necessary destination on this trail. This is a trail that in itself is a worthwhile destination. The tread is in good condition, it’s easy to follow and has a great ambience to it. After unpacking at the shelter, we filtered water and made use of the photo-friendly evening light to photograph the cascades. We gathered firewood on our way back for the fire we needed to cook our dinners. 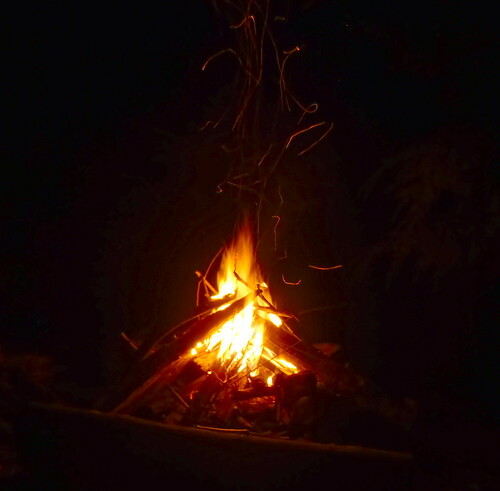 Fires are not a common occurrence on our backpacking trips, but since our dinner depended on a proper bed of coals we set about the chore with something approaching vigor. Given the chilly temperatures (the low was forecast in the mid 20s) it was also a nice way to warm up and a means of entertainment while we waited for the meat and vegetables wrapped in aluminum foil to cook. 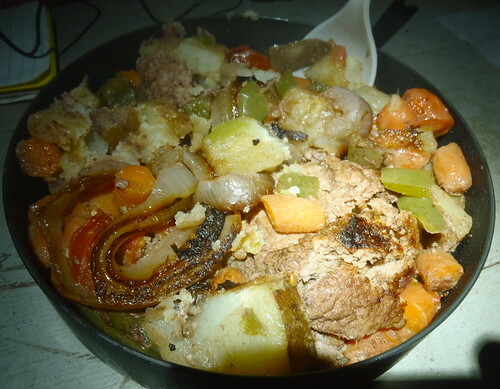 Probably one of the best meals I've ever had on a backpacking trip. As previously mentioned, “gourmet” food was a focus of this backpacking trip and we went all out for dinner our first night. Our foil packs each contained a half-pound of ground bison, potatoes, onion, green pepper, carrots and a mix of seasonings. We also had some cheese and crackers to whet (or stoke, as it seemed) our appetites until the foil packs were ready. Twenty minutes on each side seemed like an eternity. Though heavy, it was not something we regretted packing in once they were out of the coals and ready to eat. Upon waking to a cold and sunny morning, we had coffee while packing up our gear and discussed options for the day. Our only real obligation was to hike the two miles to the next shelter, which we did after exploring the Bark Camp Creek cascades and spending more time behind cameras. 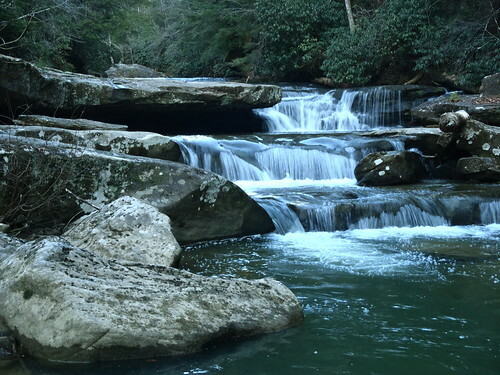 Above the cascades, there was a neat series of sluices, slides and pools which reminded me more of streams in certain parts of the Smokies than those of the Cumberland Plateau. 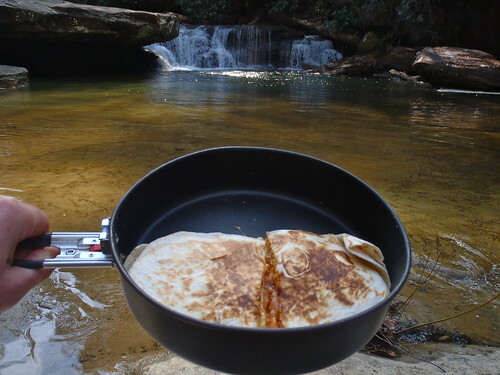 Breakfast was prepared and consumed at the cascades and was scrambled eggs placed in a tortilla with cheese and salsa and browned in a skillet -- a breakfast quesadilla. As would be expected, we determined the extra weight and prep time was well worth it. I guess it would be more accurate to say our taste buds and stomachs determined it. I’m sure our backs might have preferred lighter fare that required less cookwear in the pack. But this time the stomach and taste buds won out. It’s an ongoing struggle, and like choosing which literature to bring, which down coat to wear, or which sleeping bag to use, has likely caused many dedicated backpackers to abandon the hobby altogether and take up windsurfing rather than deal with such an avalanche of existential crises each time they wanted to go out for a night. 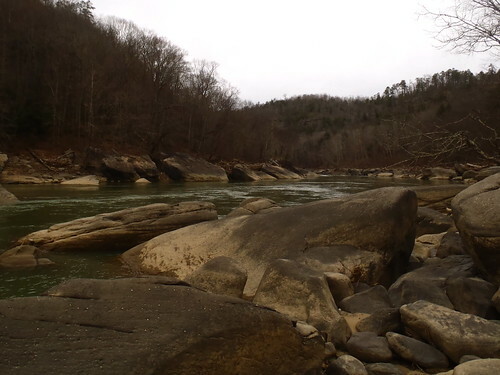 Other than some impressive cliffs, the first part of the hike from Bark Camp Creek to Star Creek is scenic but not overly dramatic, just pleasant hiking along the Cumberland River. 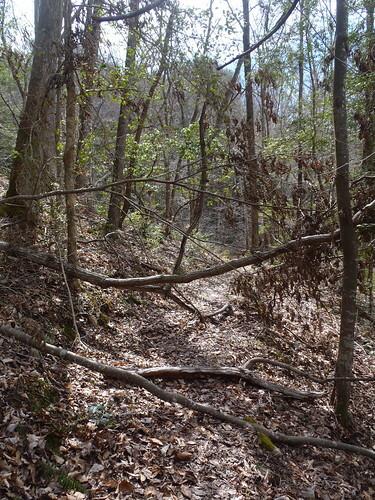 We came to several places where fallen limbs or the crown of small downed trees blocked the trail, giving us an excuse to take our packs off and enjoy a brief break while we cleared the trail using a small folding handsaw, removing the obstacle for future hikers. At Devil Creek we took an extended break to photograph a waterfall barely visible from the trail and to admire the cliffline. Shortly after reaching Star Creek shelter and engaging in the brief camp chores (made mercifully brief by the existence of the shelter, which eliminated the “finding a flat spot of ground and setting up a tent” item from the chore list), it became more overcast and the wind picked up. We explored around Star Creek Falls and the river bank (the trash along the river bank is an exceedingly depressing eyesore that is worth mentioning) before stretching out our legs, stretching out our hammocks and ultimately just stretching out and relaxing for most of the rest of the afternoon, watching the wind effortlessly push around dense blocks of clouds.The meal for the night was a staple of our backpacking trips -- pasta and tuna, but with fresh mushrooms added -- and certainly a step up in quality from the freeze-dried “just add boiling water” meals that we occasionally ate during our first years of backpacking. Not quite “gourmet” but at least we tried. We left the shelter mid-morning the next day and headed to Dog Slaughter Falls, which was at a photogenic flow and occupied the attention of a photographer, who was friendly but packed up shortly after we arrived. 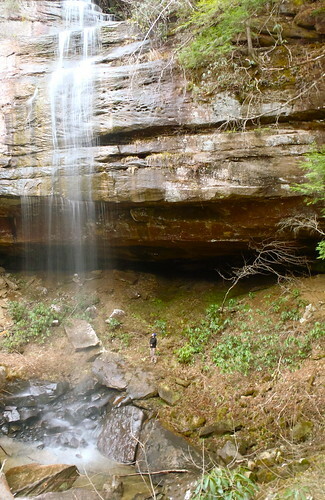 Dog Slaughter Falls is a gem of a waterfall and made a great spot to rest and snack before continuing toward the state park. 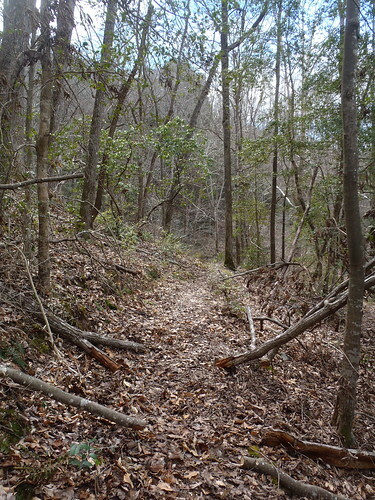 The trail between the Dog Slaughter Falls junction and the state park is a bit more rugged than the section headed north toward the shelters. Roots and rocks, along with short steep sections as the trail wrests its way through boulders, require a bit of attention to avoid an ankle-turning misstep, but the scenery makes it easy to slow down and appreciate the cliffs, boulders, ferns and mosses that thrive along the trail. 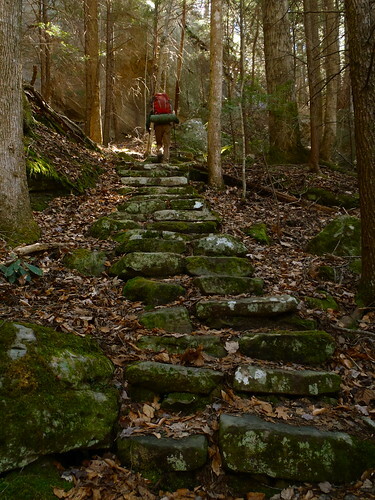 Several sets of stone steps on the steepest parts provide both physical and aesthetic relief and possibly date back to the days of the Civilian Conservation Corps, which did a lot of work in and around Cumberland Falls State Park. The trees and the noise from the river, with several nice glimpses of its course, further the temptation to make this a part of trail you take the time to savor. As the bits of trash increased and we encountered more people, we knew we were nearing in on the parking lot. We arrived at the car in the mid-afternoon and after the required post-hike stretching we headed towards I-75 and the trip passed from “present” to “past” as the forest thinned and the concrete, pavement and civilized infrastructure increased. 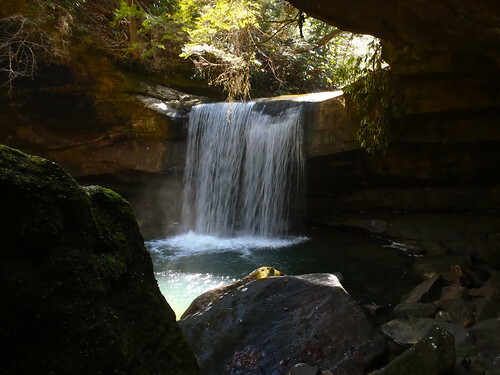 On second hike, I can certainly say that this route is one of the best backpacking hikes in Kentucky, especially if you have an appreciation of waterfalls and clifflines. There is no grand vista or towering arch, but it is a hike that is rewarding the whole way through. I’d imagine that hiking it later in the spring (wildflowers) or fall (foliage color) would be particularly enjoyable, hopefully I’ll be back in the area for at least one of those seasons this year.